It's been likened to Al Qaeda's "Vanity Fair," a new English-language Internet magazine called "Jihad Recollections" that focuses on the terrorist group, its founder, Usama Bin Laden, and how to commit jihad. It also predicts the demise of the United States. "This is designed for Americans," says noted terrorism expert Steven Emerson, founder of the Investigative Project on Terrorism in Washington, D.C., and author of the book "American Jihad: The Terrorists Living Among Us." "It's not for Brits, not for Germans, not for jihadists in the Middle East. It's designed for Americans and it's designed to get them to convert to Islam or to carry out jihad acts of terror," he said. "What started off as some angry kids in their basement has transformed over the past several years into a robust Al Qaeda propaganda outlet right here in our backyard," says Jarret Brachman, an Al Qaeda specialist and author of the new book, "Global Jihadism." Brachman says "it raises the bar for pro-Al Qaeda propaganda in English. Its presentation is flashier than any English language Al Qaeda propaganda that we've seen to date." He also says "the publication shows how deeply embedded in the global Al Qaeda movement its editors are." It is not clear what connection, if any, the magazine has to Al Qaeda or its followers. It is published by the "Al Fursan Media Foundation," but FOX News could not find such an organization or a way to contact them for comment. Yet "Jihad Recollections" certainly highlights the terrorist group and the goals of Islamic jihad in a sophisticated and graphically slick presentation similar to any high quality Web site. The magazine includes the speeches and writings of Bin Laden and his deputy, Ayman al-Zawahiri. Articles range from "Four Practical Steps to Expand the Global Jihad," to "The Science Behind Night Vision Technology" and "Principles of Guerrilla Warfare." "The magazine is quite startling," said Emerson. It is "a veritable manual on how to carry out terrorism. It's quite shocking, and the question is whether it violates the law or not." The first issue says of the 9/11 attacks, that "the strategy was genius." It calls America "one of the most atrocious and egotistical regimes to date," and it accuses the United States of spreading corruption in Islamic countries through its embassies. "How can we expect from America any good?" it asks. "We only expect from it every evil and corruption." 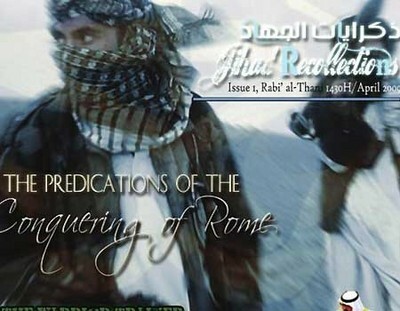 "Jihad Recollections" appears to prepare followers to engage in jihad. One section teaches aspiring jihadists how to stay in shape by doing exercise without weights. Articles with photographs of men dressed in white robes with their faces covered encourage them to exercise at home and stay away from American gyms because "they are full of music, semi-naked women, free mixing." It warns of the dangers of "showing off" during a workout and even observes that protein shakes are too expensive and not worth the money. For those who thought the election of Barack Obama as president would assuage the militant world, the magazine makes it quite clear that is not the case. "To the Muslims who voted for Obama and were optimistic that he would make a positive change ... nothing will change except things can only get worse," the magazine proclaims. "Only Allah knows how much worse it will get." The magazine criticizes the Obama economic stimulus plan, calling it "flawed," and ridicules the president as "Mr. Yes We Can," whose policies will "continue to loot all the hardworking Americans wealth." It even includes the views of some prominent critics of the president's polices, such as former New York Lt. Gov. Betsy McCaughey, now an adjunct fellow at the Hudson Institute, and veteran Tennessee Rep. Zach Wamp, the ranking Republican on the House Military Construction and Veterans Affairs Subcommittee. Such references clearly indicate an awareness of American political discourse similar to the nation's political policy magazines. In fact, "Jihad Recollections" proclaims: "It is the first of its kind as it is geared towards the English speaking Muslims who are interested in gaining heights in their religious, political, economical, social, technological, strategic, historical, biographical and health awareness." The writing may be a bit flamboyant, and while it boasts that "The U.S. grows weaker every day," there is no explicit call for violence against the country or against Americans. Emerson thinks the publication is "pushing the envelope of the First Amendment" by reporting on jihad issues, and he says it indicates that the Internet is being used as "one of the major sources for radicalization." "Thousands of people have accessed these pro-Al Qaeda websites," notes Brachman. He says "this new journal is receiving more and more praise from within the English-language jihadist movement. The fact is that their movement is growing — their popularity is growing." More than 5,000 people have viewed "Jihad Recollections" and 11 people list it as one of their "favorites." Who are its readers? And do they adhere to the jihad philosophy? Whoever is behind "Jihad Recollections" has a strange mix of opinion with one focus: seemingly to spread the message of Islamic jihad at the expense of Americans. That such a publication is accessible at all speaks to the freedoms we enjoy in our country while, experts say, also serving as a warning of the danger that Islamic militants and radicals pose to our nation. FOX News' Maryam Sepehri contributed to this report.